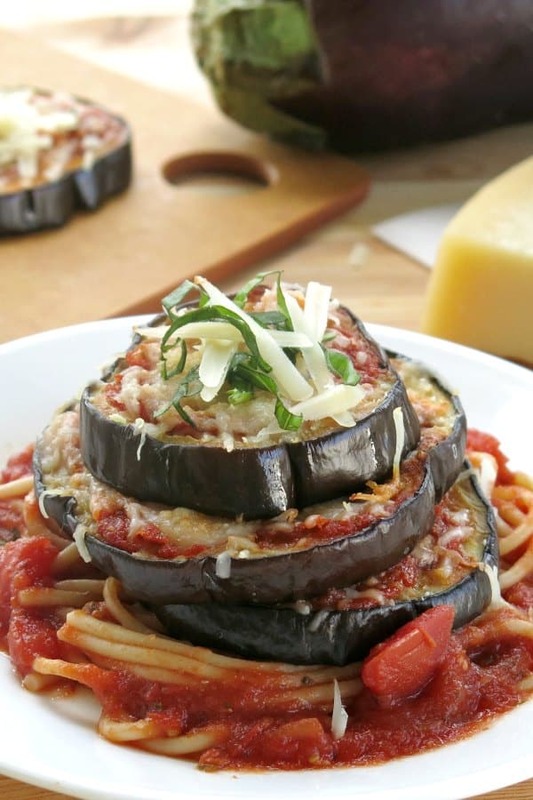 Eggplant Parmesan Stacks are melt in your mouth delicious! There’s no breading which makes them lower in carbs, gluten-free and so easy make! I’m almost didn’t post this recipe because it’s so simple. But, it’s on my regular dinner rotation and so delicious that it may become a favorite of yours too! We plated it over pasta for the picture. But, noodles are for the family and not me…and I usually don’t have any with my Eggplant Stacks. Truth be told, I’m the only eggplant eater at my house. Come spaghetti night, I make this for ME! Everyone else enjoys Baked Chicken Parmesan Meatballs, which shares many of the same ingredients. I love having leftovers the next day or I make Roasted Eggplant Parmesan Dip! Here’s what I’ve learned after years of selecting eggplants at the store and sometimes waiting too long to enjoy them! Smaller eggplants are easier to work with, have less seeds and tend to be sweeter. Eggplants should have smooth, shiny skin and green stems. When you press your finger into the skin, it should be soft and bounce right back. Once you begin slicing an eggplant, the flesh should be mostly white. However, brown spots around the seeds are normal. Sweat: Cut slices and arrange on paper towels. Salt the slices and allow them to sit for up to an hour. They will begin to sweat out juices. Rinse the salt and juices off before working with the eggplant slices. This process is supposed to get rid of the bitterness that’s sometimes associated with eggplant. Don’t Sweat: Some cooks don’t take this step and neither do I. According to this article in Saveur, it’s not necessary. I always opt for the smaller eggplants, which probably helps. Check out the pictures below to get an idea of the ingredient amounts. This is a more or less recipe – add more or less sauce and cheese, depending upon your preferences. 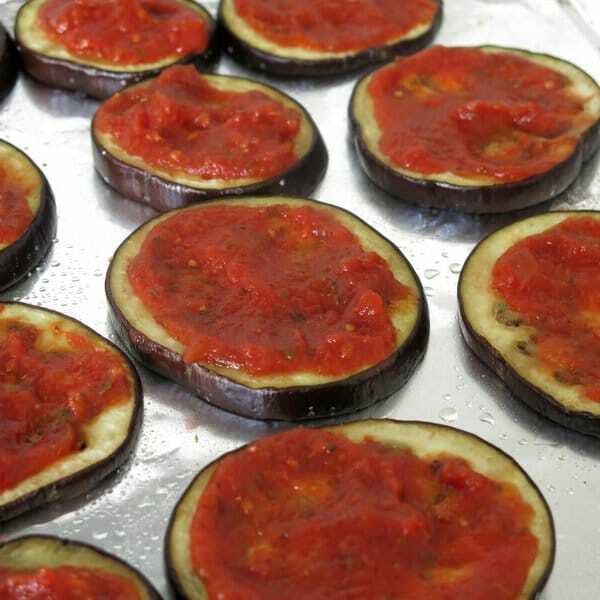 The eggplant rounds below cooked for 20 minutes before the sauce was added. I’m a minimalist when it comes to sauce! Next top with cheeses. The more the better at my house! Lower in carbs – use pasta or marinara sauce that’s low in sugar, such as this Easy Marinara Sauce. Vegan – use cheese alternatives, such as shreds and nutritional yeast. Cut eggplant into consistently sized rounds that are about 3/8 inch thick. If they’re too small, then it’s hard to pick the slices up to stack. And, if they are too big, then they need more cook time. Stack 2 to 3 rounds on top of each other or don’t! But…The varying sizes definitely make you want to stack ’em up and enjoy! Please rate this recipe and tag @DinnerMom or #DinnerMom on social media! We love to see what you’re cooking up! 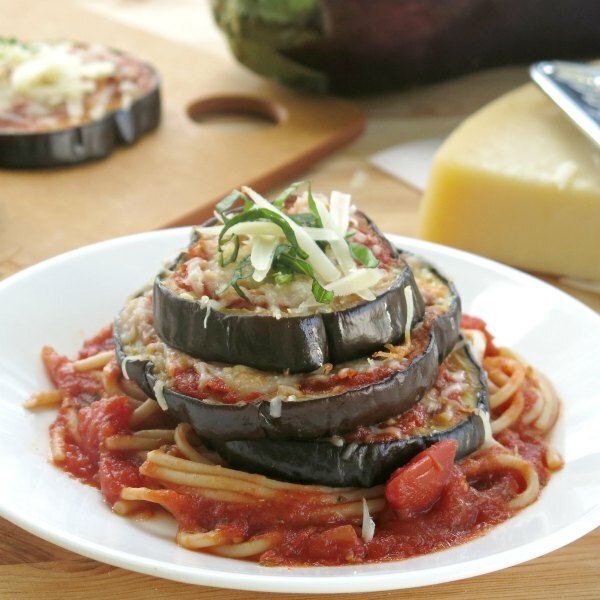 Eggplant Parmesan Stacks are ultimate comfort with a delicious Italian flavor combination. They're lower in carbs and easy to make because there's no breading! 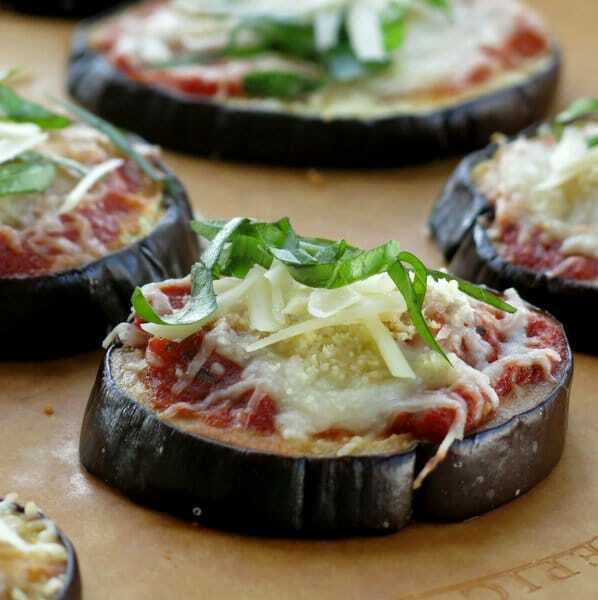 Cut eggplant into slices that are about 3/8 of inch thick. Blot excess moisture from slices with a paper towel. Lay slices on a baking sheet coated with cooking spray. Brush the top side with olive oil and sprinkle with salt. Remove from oven, flip slices over, brush the newly exposed side with olive oil and sprinkle with salt. Return pan to oven and cook for 10 more minutes. 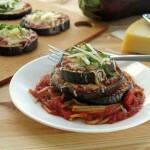 Remove pan from oven and turn temperature down to 350 degrees F.
Spread a layer of pasta sauce on each eggplant slice. Sprinkle a layer of mozzarella cheese and Parmesan cheese on top. Return pan to oven and bake for 15-20 minutes more or until cheese is melted and bubbly and begins to brown. Allow slices to cool for a few minutes before stacking. Stack 2 or 3 eggplant slices on top of each other. Garnish with basil and more Parmesan cheese, if desired. Approximate ingredient amounts are provided because the size of the eggplant and resulting slices varies. However, the method and cook time will remain the same. Use low-fat cheese and no sugar added pasta sauce to keep the recipe South Beach Diet Phase 1 compliant. 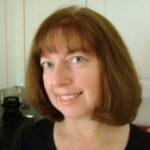 Hi Marjory! I found you through CCN FB page ;). I’m the only one in my family who enjoys eggplants..and kale (gasp! ), but I have hope that this will change soon. I do enjoy having extra leftovers though haha. Lovely photos and I appreciate this quick & easy recipe! Thanks for stopping by. Unfortunatley, I can add kale to my list too! But, I try to sneak it in here and there. Thanks Betsy. It’s in my regular rotation! This recipe is amazing!! I added some oregano and parsley to my eggplant snack !!! Oooh! Nice additions. Thanks for commenting! 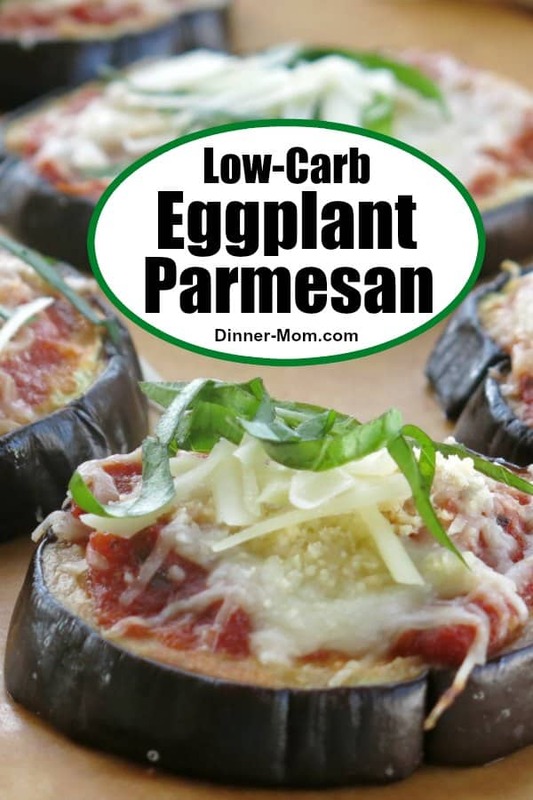 No one in our family likes eggplant, so when we got two from our CSA I offered to make these for a friend who loves eggplant Parmesan, she said it was amazing. It smelled so good coming out of the oven I almost tried it myself! Not to mention how easy it was! Thanks so much for your feedback! I’m so glad you liked it! Honestly, I don’t think is this is the best recipe to make and freeze. The re-heated rounds won’t be quite as tasty as when they come out of the oven, especially if they are on the thin side. 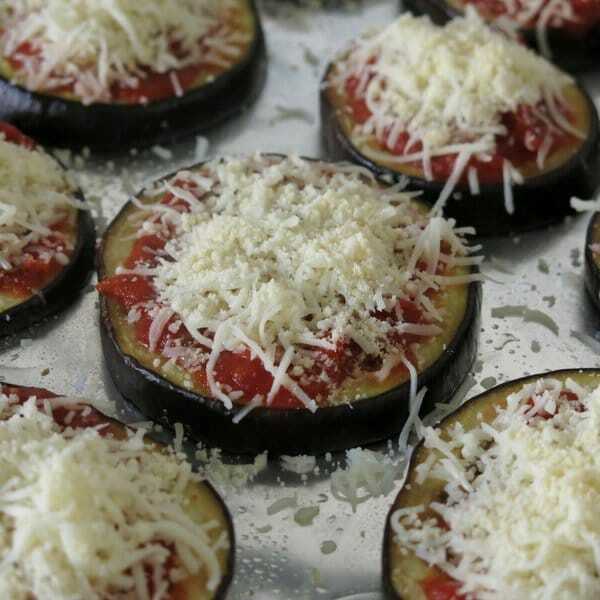 However, if you do, cook the dish before you freeze it and freeze eggplant rounds in a single layer.